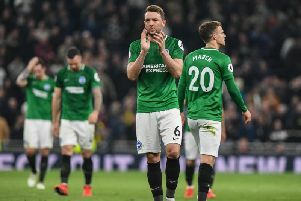 Brighton manager Chris Hughton felt his side gave Manchester United a good game as they lost 2-0 in the FA Cup quarterfinal. Hughton said: "I'm delighted with the performance from our team. I just thought the only differences were the moments in front of goal and of course the quality that they can produce. "I know they had a lot of possession and threatened a lot around the box but I thought we were as big as a goal threat as they were. Of course they had more possession which you'd expect at home but I thought we were always in the game and gave them a good enough game." Brighton made five changes ahead of the game after last week's defeat to Everton with Jurgen Locadia and Leonardo Ulloa both starting. Locadia in particular caused problems for the home side as the game wore on, going close on a number of occasions in the second half. Hughton said: "The same way people wanted a reaction here from a United side, we wanted a reaction from our team. We were poor at Everton at the weekend and we've been in good form but we will need that going into this last group of games. After the international break we've two home games which have become huge games for us. "I was very confident with the changes that we made that it wouldn't affect the balance of our team and that we could keep our good form going. We'll need that competition that we've got in the side as we've got some very tough games."